“When Adam Brown woke up on March 17, 2010, he didn’t know he would die that night in the Hindu Kush mountains of Afghanistan – but he was ready.” So begins the book Fearless: The Undaunted Courage and Ultimate Sacrifice of Navy SEAL Team SIX Operator Adam Brown. There’s no suspense in how this book will end, but the look into how Brown turned his life around and ended up in Afghanistan that fateful day makes this book a compelling read. Adam Brown had a typical childhood. Raised mainly in Arkansas, he was one of three children of an electrician and his wife. Adam excelled at sports, had a stable home life and was generally liked, yet after high school he lacked direction. This eventually led him to drop out of college, quit his job working in the family business, and get involved with a questionable group of friends. After an unsuccessful stint in rehab, Adam began stealing from family and friends to support a growing drug habit, which eventually led to arrest and a year-long stay at Teen Challenge, a residential rehab facility out of state. During the stay there, Adam became more religious and seemed to turn his life around, but more relapses followed. He met his future wife, Kelley, and eventually, after spiraling back down towards addiction, he decided to follow his childhood dream to become a Navy SEAL. Luckily, a father’s friend was a naval officer and was able to convince the skeptical recruiter to accept the drug addicted felon into service. This proved to be the major turnaround that Adam needed. The discipline required to be accepted into SEAL training gave him something to focus on and allowed him to channel his energy into his calling in life. As he and Kelley started a family, Adam began his life in the elite SEAL training program. Although he suffered some serious injuries after joining the Navy, it didn’t deter his determination or ability to be the best. 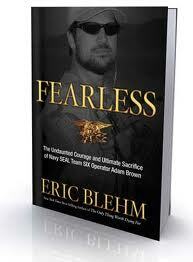 The only problem I had with the book was deciphering and keeping straight all the acronyms – HLZ, BUD/S, DEVGRU, etc. are some of them that are bandied about and repeated over and over. It can all be a bit confusing! But I did enjoy the story of the man behind the hero. We all hear the heartbreaking news of loss and sacrifice that our military families endure, and this book makes a tragic loss tangibly real.